West Coast horse racing is 76 races deep in Arcadia, California. That's the home of Santa Anita Race Track with the San Gabriel Mountains as a magnificent backdrop. It's been dubbed "The World's Most Beautiful Race Track." If you love horse racing, you should visit the one-mile oval about 45 minutes outside of Los Angeles. A few more tidbits of trivia before we move onto what's happening so far at Santa Anita. It was the first sanctioned track in California and the first in the country to offer $100,000 in prize money for a single race; back in February 1935 with the Santa Anita Handicap. To help you with your handicapping and to sharpen our saw too, let's see how things are shaping up at Santa Anita. So far, the most frequent distance and surface is 6-furlongs on dirt. Meet-to-date, 17 times horses have battled it out/on at this distance/surface. A few quick observations, the rail has only one win. No matter how good the rail looks, we'd consider moving him/her down your ticket until the one picks up the winning percentage at 6 dirt furlongs. The two and four holes are leading the way with four wins each. Fascinatingly, the four has favored speed types to date with the average winner racing in 1.7th position at the quarter-mile pole. Meanwhile, the two's average placement at the quarter call is 3.5. Things that make you go hmmm. Overall, the typical quarter-mile placement for winners running from post one, two and three is 3.28. From gates four through six, it's 2.1. The moral of the story, so far at least, is play outside speed and inside stalkers for 6-furlong dirt races at Santa Anita. One of the quirkier races in all of America is Santa Anita's downhill, 6.5-furlong sidewinder on the turf. Have you seen this thing? The horses sprint down a hill, run through an S turn, change lanes over dirt, hook a left and then dash to the finish line. It's sort of confusing to watch. See for yourself. Despite the odd path and winding way to the finish line, there has been a definite BIAS meet-to-date in these downhill affairs. You want the winner? If so, focus on horses with early speed. Of the ten races run, eight of the winners ran first or second, split evenly, in the opening quarter of a mile. That's an 80% angle or 1 to 4 odds, meaning you have to bet $4 to win $1. Another thing to note, seven of the 10 to raise the crown raced from the fifth-post out. Getting more detailed, two winners each came from the five, six, and seven slots, six-of-ten (60%). Looking at the past performance sheets, if you see a horse that runs first or second, lined up from five to seven in the gates, take him/her. Statistically speaking, it's been a great bet early on at Santa Anita. The only other distance and surface with enough data to make any sort of determination is one-mile on the turf. Fourteen races all on firm footing give DIY handicappers a glimpse of what might be to come. Here's the way the trends break. Once again, we find that post-position plays a significant role in outcomes. The rail is a no-show; leave him/her off the top of the ticket unless a true superstar is riding the rail. Even then, consider fading a heavy favorite wearing the red 1 at a mile on turf. Backdoor exactas and trifectas pay nicely when big-time favs runs second, even better out-of-the money. Only four of the fourteen to win a one-mile grass race ran from gates two and three. That's it for the inside horses. Otherwise, the remaining 10 lined-up from four and out. Six of the remaining 10 dawned an eight on their jersey or higher. Nearly completely opposite of the kooky, 6.5-furlong, downhill race where speed is all you need, one-mile turf favors stalking to closer types. There have been a pair of wire-to-wire jobs, and another two where the eventual winner raced second in the opening quarter-mile. Overall, the average winning horse is fourth after the opening quarter and half mile, just stalking the leaders waiting to pounce. Most of the action happens in the last two furlongs as the soon-to-be victor runs close to third heading into the stretch, and then closes out the show with a kick. The play here is to identify stalkers/closers, especially those that are lined up in the outer-posts, ideally sixth or higher. Hopefully, some of what we have found in the early part of Santa Anita's fall run will help you find a few more winners. We'll continue to update the numbers and dig through the data at all the major horse racing venues to bring you an edge at the track. 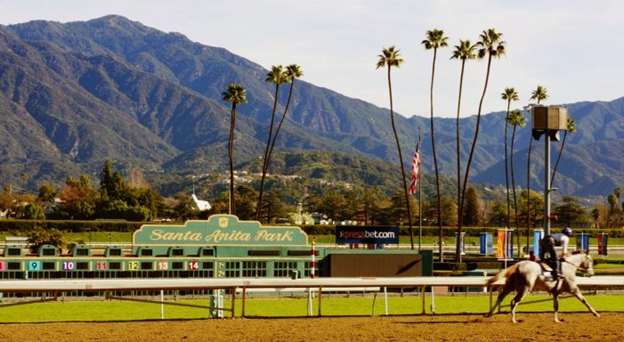 GET OUR FULL CARD SANTA ANITA PICKS PLUS ALL OTHER TRACKS! Good luck at the races and may all your tickets be winners!